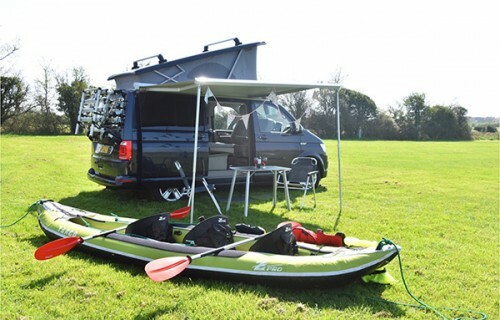 Camperbug camper van hire locations across Somerset include vw vans that can be picked up in Taunton, Yeovil and Bath. I am Bonniebear, hire me today! We have two VW T6 California Oceans with 204 bhp 7 speed DSG autos 4 berth with electric roof, including Apple connect, sat nav, led lights, rear shower attachment, side scan, Alcantara seas, Bluetooth, radar cruise control, remote heating, drive away awning, airport collection, cycles and rack, Cobb bbq, bedding and much more. Pet friendly Your car can be left safely and will receive a complimentary valet ready for your return collection. Hire includes unlimited mileage and fully comprehensive insurance. We have two locations in Somerset and Yorkshire. From our Somerset base you can tour Devon/Dorset, Cornwall and Wales. Our Yorkshire base opens the door to the stunning Lake District, Northumberland, Yorkshire Moors and Scotland. Milo, our pale blue 1969 right hand drive early bay window VW camper�van has been fully restored by G'day Kombis. Milo has a 1600cc air cooled engine and bespoke interior alongside a host of other additions and upgrades. Tallulah,�our traditional orange 1978 right hand drive bay window VW camper van,�has been fully rebuilt with loving care and attention by G'day Kombis and boasts a new 2 litre air cooled engine and new gearbox amongst a host of other additions. Red 2009 T5 fully equipped Campervan. Nice conversion with grey and Chrome trimming, LED lighting throughout and extra thick rock and roll bed. Volkswagen T30 140 TDI, conversion, 2012 with a side elevating roof. This van is not for holiday hires! Please don't send holiday hire enquiries as it is not for self drive hire. If you need a camper for your wedding or for a promotional event, then please drop us a line. Converted from a panel van, Guy has a large bed and big slide out kitchen at the rear. Sam is our light blue 1965 authentic right hand drive split screen 2 berth VW camper van with a fully re built 1600cc air cooled engine and brand new brakes. Original Volkswagen Devon Campervan from 1983. Still has original charm but with modern look and features.